In September 2018, IDG UK will release the “Workplace of the Future” study. 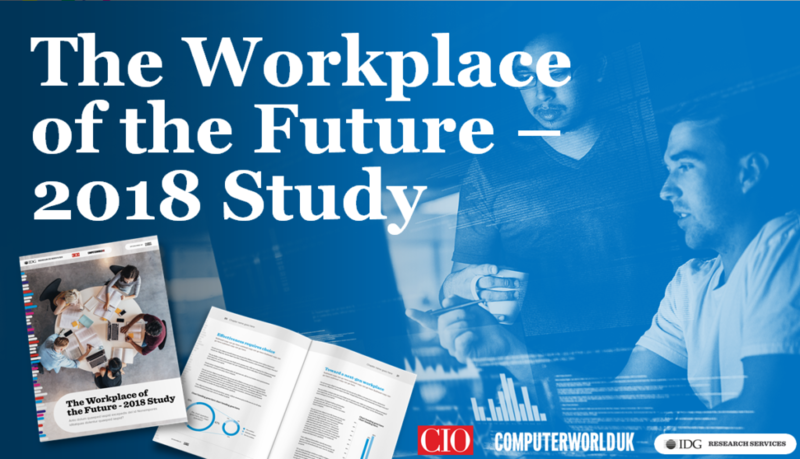 This comprehensive research will examine what has become a pivotal topic in the enterprise, including the cultural and technological impact the future workplace may have on both employers and employees. The future of the workplace is being transformed by numerous factors, from millennial workers and changing work attitudes through to the emergence of new technologies. As such, every aspect of work is changing. Workers have greater flexibility on where and when duties are performed – and using which tools – whilst new working attitudes are shaping how offices themselves are designed and laid out. As a result, businesses are focused on how all of these factors can positively impact worker productivity, workplace happiness and overall drive a more connected workforce. In short, in this digital economy age – where IT change is being brought about by non-IT influencers, we are moving to a time where the workplace looks very different to how it did 20 years ago, with different people, cultures and technologies. And maybe eventually, the workplace will see man and machine work side-by-side. Last month, we invited 12 CIOs/IT Directors to participate as members of the Research Steering Committee and help with the creation and editorial direction of this crucial piece of work. This group of hand-picked CIOs, thought leaders and commentators, alongside IDG editors shaped the study and themes. Over the next few weeks the survey will be fielded to CIO UK and Computerworld UK audiences, allowing for robust, real-time qualitative and quantitative feedback. The Workplace of the Future Study will be officially unveiled at the 2018 CIO Summit which is taking place on the 20th September at the Shangri-La Hotel, The Shard, London. The CIO Summit is a well-established, content rich event packed with debates, seminars, workshops and expert panel discussions which is now running for its 9th consecutive year. 100 senior IT professionals will be attending and it is the perfect arena to showcase the research findings. There are still opportunities to be involved in Workplace of the Future Study as a Research Partner. Research Partners will gain vital intelligence on the senior IT audiences and their customers whilst aligning themselves with authoritative, impactful insight through editorial coverage and content marketing.